Fort Walton Beach, Fla. – Tickets are on sale now for the 2nd Annual Thrive Music Fest to benefit Covenant Hospice. The event will be held Saturday, June 20 from 3 p.m. to 2 a.m. in downtown Fort Walton Beach. Advance tickets are $10 each (through June 17) and are available online at www.thrivemusicfest.org or at the Covenant Hospice branch office, 220 Eglin Parkway NE, in Fort Walton Beach. Austin Jennings (Destin, Fla.), Cadillac Willy (Destin, Fla.); Chauncy Crandall (Navarre, Fla.); Chris Carter (Fort Walton Beach, Fla.); Dew Pendleton Band (Pensacola, Fla.); Dismal Creek (Santa Rosa Beach, Fla.); Gypsy Riot (Pensacola, Fla.); Hotel Oscar (Destin, Fla.); New Earth Army (Fort Walton Beach, Fla.); Nick and The Ovorols (Chicago, Ill.); Nik Flagstar & His Dirty Mangy Dogs (Fort Walton Beach, Fla.); Something to Yield (Fort Walton Beach, Fla.); Strange Tang (Fort Walton Beach, Fla.); Sway Jah Vu (Tallahassee, Fla.); The Okaloosa Sound (Fort Walton Beach, Fla.); The Owsley Brothers (Freeport, Fla.); The Rips (Destin, Fla.); The Wide Open (Fort Walton Beach, Fla.) and V-8 Death Car (Mongtomery, Ala.). 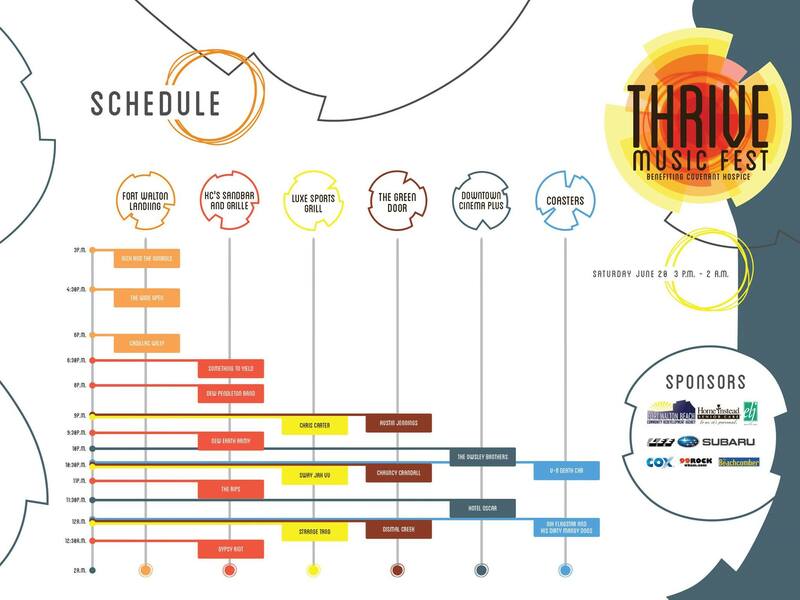 “In recognizing a flourishing downtown Fort Walton Beach with increased energy and a dynamic local music scene, we felt like Thrive Music Fest was a natural fit both to celebrate a growing community and to ensure that Covenant’s compassionate care is available to anyone in need of our services, regardless of financial status or their ability to pay,” explained development manager Rachel Mayew. Sponsored by the Fort Walton Beach Community Redevelopment Agency, Lee Subaru, Home Instead Senior Care and the Emerald Coast Professional Firefighters Council, the event kickoff at The Fort Walton Landing is free and open to the public. This venue will feature three performances, vendors and children’s activities from 3 p.m. to 7 p.m. Wristbands are required for access to additional music venues and will be available on-site at all locations the day of the event. Corporate sponsorships and underwriting opportunities are available and participating organizations will receive a variety of benefits including promotional recognition and complimentary admission to the festival. Volunteers are also needed, including those with stage, sound and production experience. Vendor applications are still being accepted with limited availability. For more information, contact Rachel Mayew at (850) 428-0605 or by email at rachel.mayew@covenanthospice.org. Covenant Hospice is a not-for-profit organization dedicated to providing comprehensive, compassionate services to patients and loved ones during times of life-limiting illnesses. 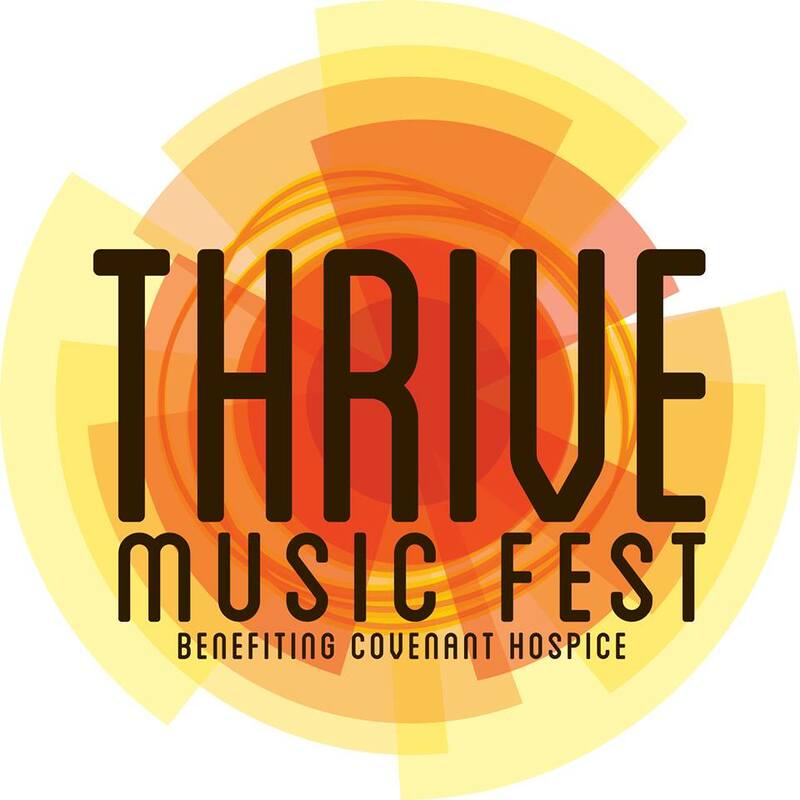 Fundraising events such as Thrive Music Fest help fund Covenant Hospice’s special programs in Okaloosa and Walton counties. These programs include bereavement services, children’s support programs, chaplain services and indigent patient care. Covenant Hospice accepts patients regardless of ability to pay. In 2014, the organization provided over $1.7 million in care for uninsured or under-insured patients facing a terminal illness. For more information about Covenant Hospice or to make a hospice inquiry, contact the local branch office at (850) 729-1800 or visit www.covenanthospice.org. This entry was posted on June 12, 2015 by 850music in Posts and tagged press release.